1. 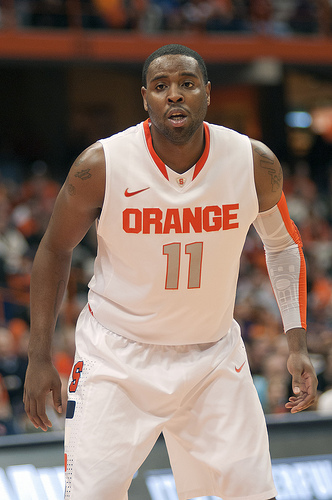 Syracuse (8-0) – The Orange remain unbeaten and pick up a non-conference top-10 win over Florida. 2. Louisville (7-0) – Peyton Siva and his Louisville Cardinals look very impressive early, like Cuse, picked up a big win in the Big East/SEC Challenge over No. 19 Vanderbilt. 3. Marquette (7-0) – Have to move the Golden Eagles up in the rankings after winning a road game at the Kohl Center over Wisconsin. It’s rare to win on the road against Bo Ryan’s Badgers and it needs to be recognized. 4. Connecticut (7-1) – Ryan Boatright has already started to help this team and now the Huskies can also move up in the rankings next week if they beat newly-ranked Harvard this week. 5. Pittsburgh (7-1) – Still waiting for Jamie Dixon and Ashton Gibbs to really make this team move. After a weird loss to Long Beach State, the Panthers have won five straight. A positive is Pitt doesn’t play a ranked opponent until 2012, which means Pitt should be racking up more and more wins. The Big East, shocker, dominated the SEC, shocker! Kentucky blows out St. John’s – The Red Storm got blocked 18 times and the Wildcats look like a team that could win a national title, while St. John’s is a young team with a lot of potential. God’sgift Achiuwa had a strong performance with 18 points and 10 boards. Georgetown upsets No. 12 Alabama – Jason Clark is doing exactly what he has to do and that is dominate for the Hoyas. The senior guard had 22 points, while big man Henry Sims has provided a nice contribution this year. The Hoyas weren’t projected for their typical high seed, but this could be a season changer for G’Town. Syracuse tops the SEC’s best, Florida – The two top teams in each conference hit the court at the Carrier Dome and better team prevailed. Fab Melo has really impressed me this season and I believe Cuse is a team that can be a Final Four contender. With another tough season of Big East basketball ahead, this win against at top-10 team will go a long way. Louisville downs No. 19 Vanderbilt – Peyton Siva is clutch, plain and simple. Louisville has impressed me early and I think Siva has the chance to have a special year. He’s proven that he is capable of big-game moments and this Cardinal squad has a backcourt that can compete with the Big East’s best. Marquette picks up big road win over Wisconsin – No one wins at the Kohl Center, I mean nobody. That is unless you play in the Big East. Even without starting point guard Junior Cadougan, who was suspended for team violations, the Golden Eagles still were able to knock off the No. 7 Badgers. Marquette could be another team that joins the ranks of – Cuse, UConn, and L’Ville as the tops of the Big East in 2011-2012.